A commercial heating and air conditioning (HVAC) company had a closed loop chilled (40 ºF) water system that was experiencing cracks and leaking in its brass valve fittings. OCE performed a visual and metallurgical examination. 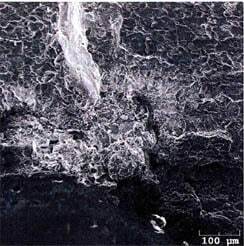 The fracture surface was examined at higher magnifications using a scanning electron microscope (SEM) equipped with an energy dispersive x-ray spectrometer (EDS). It was concluded that the fracture of the submitted brass connector initiated at a sharp corner on the inside diameter surface. Dezincification corrosion was found to be occurring at this location as well as other locations on the inside diameter surface. 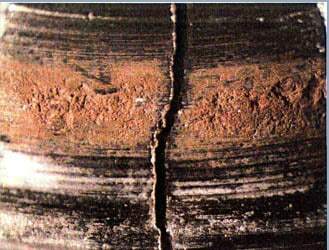 Dezincification is the selective leaching of zinc from brass alloys leaving behind a porous copper plug. The image below shows the fracture initiation site at 140x.